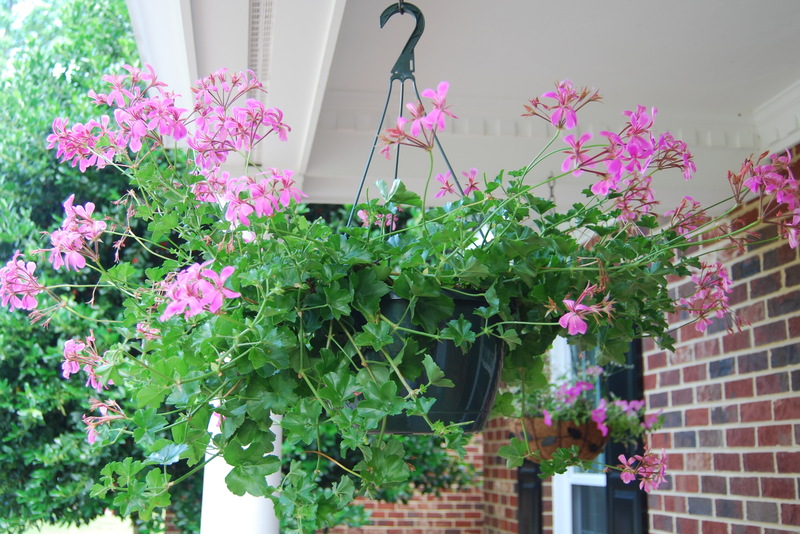 This entry was posted in Days at Home and tagged geranium, gerbera daisy, guara, petunia, purslane. Bookmark the permalink. I so wish I had a garden to get my hands dirty!! But I do enjoy seeing pictures of your beauty. And our maintenance people planted rose bushes recently to replace some bushes that had died. They’re the type that bloom all summer. I’m enjoying those. And the multi-colored day-lilies around the buildiing. beautiful landscape gardens….and i see water in the background of one photo so all the stunning sunset pictures must be taken right from your home. i live on a river….we get gorgeous sunrises, but only in winter!! wow! 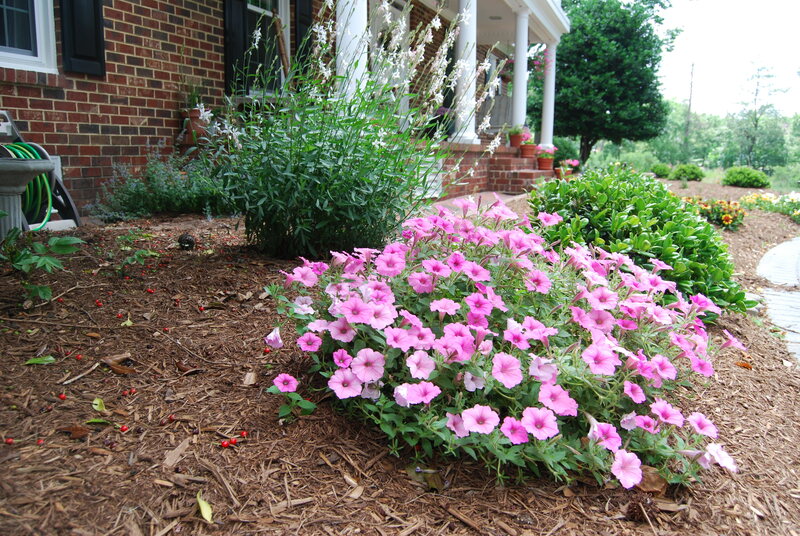 you’ve got a green thumb – especially those that keep coming back year after year! Looks like Spring is in full swing around there! 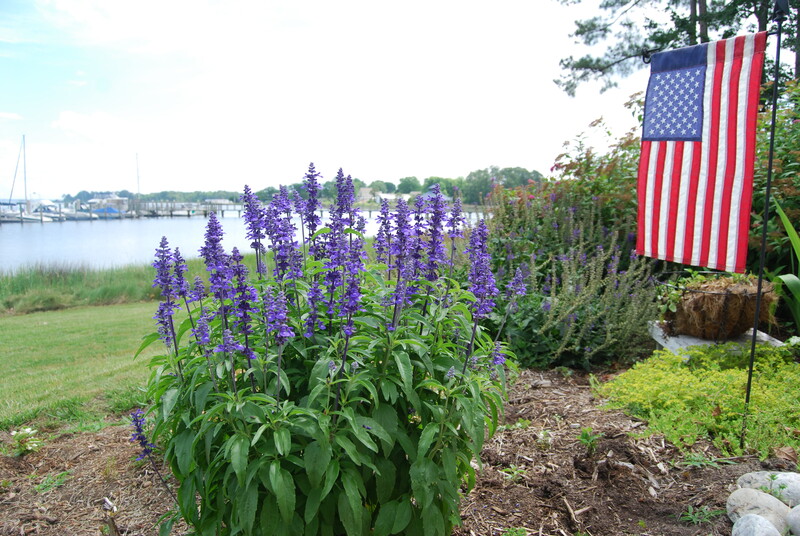 As you know, the Larkspur are some of my favorites: white, purple, and blue together .. great combo!! That’s a great Memorial Day-style pic for number 1! I love your flowers as well as your darling little bench. 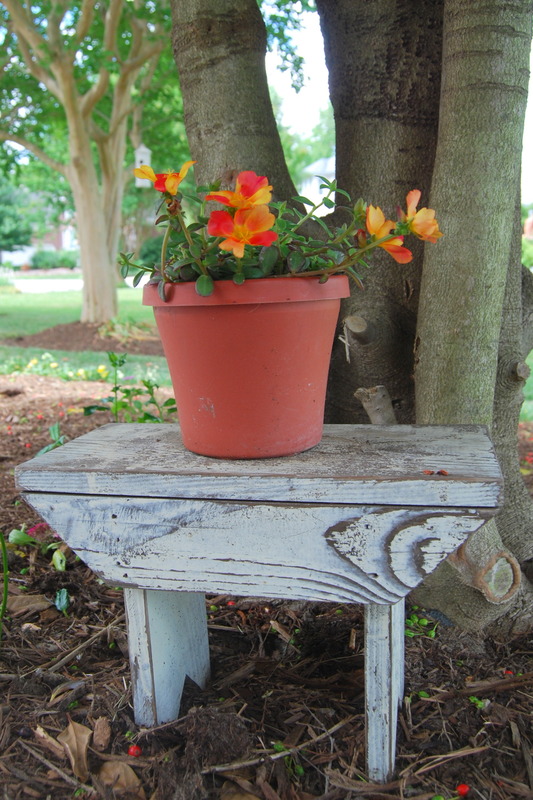 Like you, I love finding little stools and things to place my plants on. The purslane is new to me and so pretty. I didn’t know there was a perennial petunia. Lovely! You are surrounded by beautiful colors. Lovely post. We have a lot of white…azaleas two mos. ago, bridal wreath, narcissus, calladiums and then a pop of red with the amaryllis. With all our shade the crepe myrtle blooms late in August. Your flowers are lovely — I looked at your pictures this morning and was inspired to get outside and work my own flowers into the garden. I got good and muddy — tomorrow I’ll be good and achy — but it’s so worth it when they are blooming. I loved your Sunday stroll. You do have a way with flowers. Always beautiful. 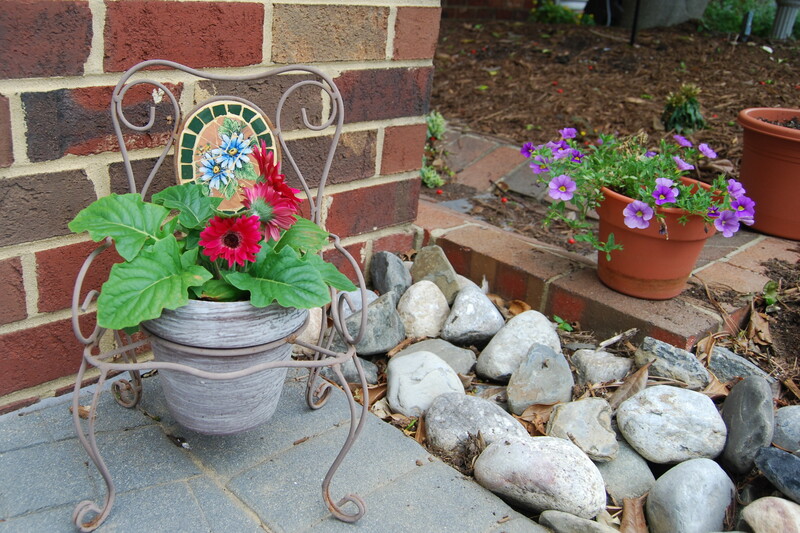 Your flowers are so pretty and I love the containers you have for them. Presently I have Stella d’Oro daylilies putting on a show, purple coneflowers beginning to bloom, and orange June lilies. I have two little plant “nurseries”where I’ve started oriental poppies and foxglove from saved seed. Wish me luck with them.